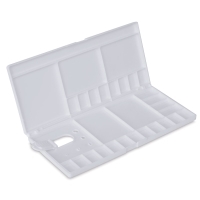 The portable Reeves Plastic Folding Palette is suitable for all types of paint, including watercolors, oils, and acrylics. 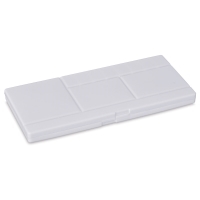 It's made of an extremely durable, lightweight white plastic. A convenient thumbhole makes the palette easy to hold and control, which is helpful when painting outdoors or while standing up. There are plenty of wells, both large and small, to store and mix your colors. 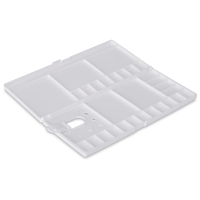 The palette measures 14"H × 6½"W × ¾"D.